Implantation Dip an Early Sign of Pregnancy? An implantation dip is a luteal phase dip that will typically occur between 7 and 10 days past ovulation (DPO), and is an indication of implantation – an early sign of pregnancy when the fertilized egg implants itself. An implantation dip is an increase in your estrogen hormone so it lowers your temperature creating a dip in your basal body temperature (BBT). For many women, during implantation, they may also experience some spotting around this time called implantation bleeding. Does an implantation dip mean you’re pregnant? Here’s a look at my chart. You will notice right here that the temperature goes up during ovulation. Hopefully you can see this and then right here, it shoots back down at 6 DPO and it goes back up. You can see this red line and here’s the dip directly underneath it. So you will notice right here in this chart, they are not pregnant. There is no BFP unfortunately and they did a start a new cycle. But right here, you will notice an increased inner temperature. Ovulation occurred and then they had a major dip right here. This is a perfect picture of an implantation dip. It occurred for them at 6 DPO, six days past ovulation. You could see an implantation dip as early as 6 DPO or as late as 12 DPO. 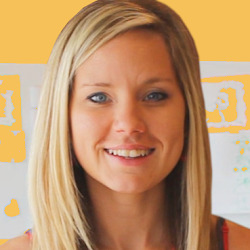 Basically what you are looking for is a dip in your basal body temperature. Now an implantation dip is fairly uncommon for a non-pregnancy chart & will only show up in about 10% of non-pregnant charts. This is a pregnancy chart, and you will notice the dip occurs right here at 8 DPO at the time of implantation. This is the time that the fertilized egg is implanting itself. Now, an implantation dip only occurs in about 25% of pregnancy charts, while a full 75% of pregnancy charts never show an implantation dip. So you can find it in both charts. However, it is more commonly found in those that are pregnant. So with that said, if you do see one, it’s a great indicator of a possible pregnancy. However, remember you must test with a pregnancy test to be sure. What does your BBT look like when you’re pregnant? 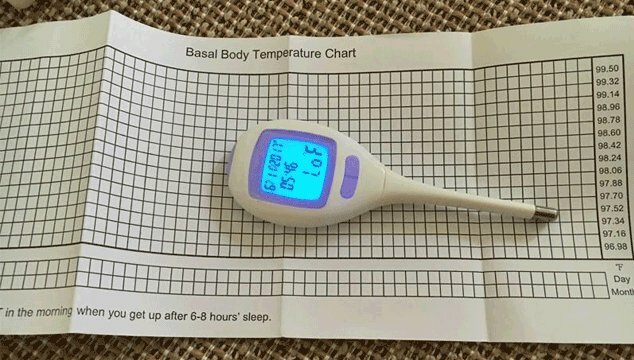 Aside from pregnancy, you must realize that your body basal temperature is the temperature that is the lowest at a time of the day. Therefore, when you are sleeping, your BBT drops and does not rise until you are up and moving around during the day. That is why it is crucial that women who are tracking their ovulation by charting their BBT, they must do so right after they wake up in the morning. Take your temperature before getting out of bed. Put your thermometer on your bedside table to test before getting up for anything! That is when a slight rise in the temperature is detected first thing in the morning because ovulation is happening. With that said, during the first part of your cycle, which is menstruation, your BBT will be steady. Right before ovulation, there will be a slight drop in your temperature, but right after ovulation, there will be a slight increase in your BBT. That is just a general example of what to expect your BBT to look like before conceiving, and after conceiving. These temperatures can be variable because every woman’s body responds differently to changes in hormones. Not to mention, this example was for women who have a typical 28-day cycle, which may not be the case for you. That being said, don’t become hung up on this example, so that means you have to chart the temperatures that are normal for you. But it will give you a starting place, a general rule of thumb. 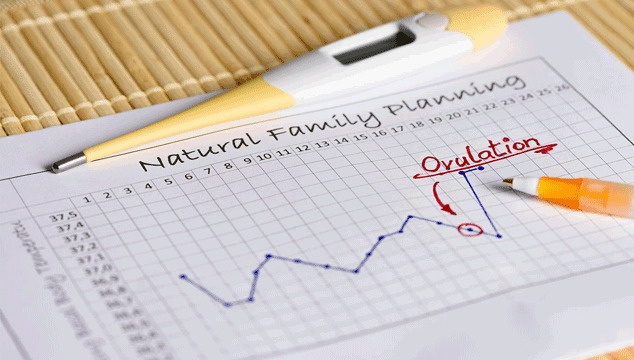 How long after ovulation does implantation take place? Most people consider when the sperm and egg join that to be a pregnancy. Even though that is technically true, the sperm-egg composition which is the blastocyst must implant properly into the uterine lining. If that doesn’t happen, the woman will not know that there was any fertilization that took place and will end up with a period, just like she had with other previous cycles. That being said, in order for a pregnancy to happen is when the blastocyst nestles into the side of the womb, which is called implantation. And that happens, placental tissue begins to secrete the hormone hCG which is what gives the pregnancy test a positive result! Implantation may take a few days up to over a week after ovulation. That said, on average, implantation takes place 7 to 10 days after ovulation, and many women experience slight spotting at this time (often mistaken for a light period), which is called implantation spotting. That is why you are encouraged to wait to test for pregnancy until you are at least a day late for your period so enough of the hCG hormone is detected to cause the test to be positive. A triphasic chart shows three temperature levels in the cycle, which is pre-ovulation, post-ovulation as well as another rise around 7-10 days after ovulation. A triphasic chart can be an indicator that pregnancy has happened because progesterone levels go up after implantation which can result in a triphasic pattern. However, don’t get too excited if you see a triphasic pattern because even though many times it does indicate that pregnancy occurred, that is not always the case. Sometimes an unexplained shift in hormones can be the cause, and in order to confirm a pregnancy, you need to test for it. How long does your BBT stay elevated after ovulation? If there is no pregnancy, your BBT will stay elevated for 10 to 16 days, until you get your period. The cause for the increased temperature is the increased levels of progesterone after ovulation has happened. Like it was mentioned above, while you are pregnant, your BBT will stay elevated. However, right before you are about to get your period, the progesterone levels drop, which will result in a drop in your BBT. So a positive pregnancy BBT chart is one whose temps stay high! This is useful for women to know as well, because if they know when they are ovulating but they are getting their periods less than 12 days after ovulation, then that is a sign that there is a luteal phase defect which means that progesterone levels are dropping too quickly. Therefore, if fertilization happened then implantation will not likely happen, and the blastocyst will end up being lost in a period. That said if the temperatures are dropping less than 9 days after ovulation, and a period sets in right after then there is likely a luteal phase defect coming into play that will need to be treated or else early miscarriages will keep happening due to low progesterone levels. There are many ways to correct a luteal phase defect, by lengthening the luteal phase. Many natural vitamins and supplements can do this job, such as taking 50mg of Vitamin B6 from ovulation through the end of cycle. Or, you could take ConceiveEasy fertility blend – a daily once-a-day tablet that also is incredibly effective at lengthening short luteal phases. How does basal body temperature predict ovulation? If you have been taking your BBT since day 1 of your cycle, which is the first day of your period, and you notice a slight drop that is less than 1/2 a degree in Fahrenheit, then that may be a sign that you are ready to ovulate the next day. The changes in hormonal levels such as the surge in the LH and FSH can cause the temperature to drop slightly, but this is not the best way to rely on when your most fertile time happens to be. The BBT tells you a lot more about when you do ovulate in your cycle since it elevates after it happened due to increased progesterone levels from ovulation. In order to properly predict when you ovulate, you can use ovulation predictor kits to measure the LH levels. If it detects a surge that ovulation is going to happen in 1 to 2 days. Another good way to predict ovulation is by tracking the cervical mucus consistency. If the mucus is cloudy and sticky or scant like it is right after your period, then you are not close to ovulation. However, if it is becoming more abundant and has a texture of raw egg-whites, then you will be ovulating in 1 to 3 days, which is a more accurate way of predicting ovulation than relying on BBT temperatures. Yes, the temperature will drop, but it is very slight that you may not notice it which could mean a missed opportunity if the other ways to track are not utilized. Now I’ve had three successful births and none of our charts in our four years of trying to conceive have I ever personally had an implantation dip. This is my last chart and you will notice that there is no implantation done, and this is basically what all of my charts look like. But an implantation dip can definitely be one of the early signs of pregnancy, especially when in conjunction with some of the other more common early signs of pregnancy. Do keep in mind though that an implantation dip will not always show in a pregnancy chart, so don’t fret if you don’t have an implantation dip – it doesn’t mean you’re not pregnant. On the other hand, if you do have a dip in your chart, there is the chance that it is still a non-pregnant chart. Only testing will tell for sure.